Juliet Akello is a Postdoctoral Fellow – Plant Pathology (Aflatoxin Biocontrol). She is part of the IITA team in Lusaka (Zambia). An alumnus of the University of Bonn (Germany), She received a Doctorate of Plant Pathology/Entomology in 2012. She obtained an MSc (Crop Science) in 2008 and a BSc (Biomedical Laboratory Technology) in 2005 from Makerere University, Kampala, Uganda. She received a Diploma in Science Technology (Biological Techniques) from Uganda Polytechnic Kyambogo, Uganda in 2000. Before this appointment, She was a Senior Lecturer at the University of Umutara Polytechnic (UP), Nyagatare, Rwanda. 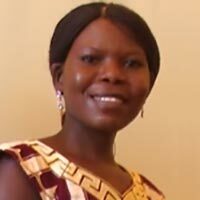 She worked as a Junior Researcher at the Center for Development Research (ZEF), University of Bonn, from August 2008 to March 2012, as QA/QC Coordinator at the Makerere University Walter Reed Project (MUWRP), Uganda from September 2007 to July 2008, a part-time Lecturer at Makerere University from August 2006 to July 2008, a Consultant at Agrotechnologies Limited (AGT), Kampala, Uganda from September 2007 to July 2008, and Research Assistant from October 2001 to October 2005 with IITA.